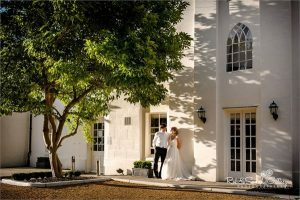 With a rich and fascinating history that stretches back to 1787, Warwick house is an elegant and exclusive venue for wedding celebrations and civil ceremonies. Encircled by trees, the 19th-century house is situated in the historic market town of Southam and easily accessible from the M1, M6 and M40. Set in a conservation area, the mansion house has been sensitively restored and oozes sophistication with its high ceilings and gothic windows. Step outside and you find a stunning terrace and sunken garden complete with a romantic and licensed gazebo. 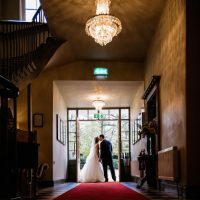 St James C of E Parish Church is situated a short stroll from Warwick House allowing local couples to tie the knot before heading back to the mansion for a reception or wedding breakfast. Exclusively yours throughout your memorable day, you can mix and match rooms and settings to suit your needs. Simply decorated the Warwick room creates a blank canvas that compliments your choice of decorations. Chandelier lighting and high ceilings add to the elegance of the versatile setting. 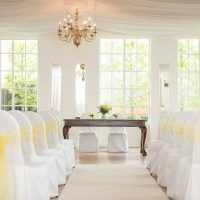 Traditionally decorated and furnished, the Regency room provides a soft and sophisticated space for ceremonies and receptions. High ceilings, gothic windows and chandelier lighting add to the romantic ambience for your special day. The Banqueting hall is suffused in natural light through floor to ceiling windows that overlook the terrace and gardens. Neutral décor and chandelier lighting create backdrop that will compliment all styles and decorations. Between the months of March and October couples can tie the knot in the fairy tale gazebo in the sunken lawn. 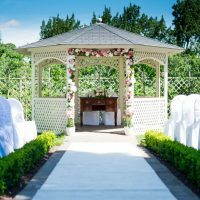 Equipped with a PA system for those all-important vows and speeches the gazebo has a wonderfully intimate atmosphere despite its large capacity. 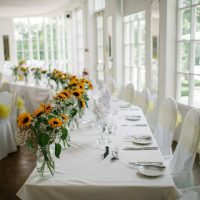 Regardless of size Warwick House caters for weddings and civil ceremonies of all sizes whether you want a small intimate gathering of nearest and dearest or a grand event with up to 200 guests. Packages can be tailored to suit your needs, or for couples who want to keep things simple a variety of set packages deliver a stress-free alternative. The catering team are as flexible as the venue itself and can create bespoke menus to suit your tastes and dietary requirements. Using the freshest, locally sourced and seasonal produce means that your food will taste every bit as delicious as it looks. To fully relax before or following the excitement of your special day, choose from 16 beautifully appointed rooms. For an extra special and luxurious experience take advantage of the sumptuous honeymoon suite and 2 deluxe suites for close family or friends. Additionally, Warwick House boasts a spacious and thoughtfully furnished bridal preparation area. With plenty of room for the bridal party, make-up artist and hair stylist it provides a convenient space for getting ready and for freshening up throughout the day.